Not to be confused with worldbuilding, the process of developing an imaginary world. This article is about the hypothetical planetary engineering process. For the Shellac album, see Terraform (album). For the Knut album, see Terraformer (album). For the software, see Terraform (software). "Terraformers" redirects here. For the manga and anime franchise, see Terra Formars. The concept of terraforming developed from both science fiction and actual science. The term was coined by Jack Williamson in a science-fiction short story ("Collision Orbit") published during 1942 in Astounding Science Fiction, but the concept may pre-date this work. Even if the environment of a planet could be altered deliberately, the feasibility of creating an unconstrained planetary environment that mimics Earth on another planet has yet to be verified. 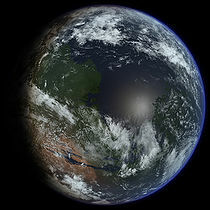 Mars is usually considered to be the most likely candidate for terraforming. Much study has been done concerning the possibility of heating the planet and altering its atmosphere, and NASA has even hosted debates on the subject. Several potential methods of altering the climate of Mars may fall within humanity's technological capabilities, but at present the economic resources required to do so are far beyond that which any government or society is willing to allocate to it. The long timescales and practicality of terraforming are the subject of debate. Other unanswered questions relate to the ethics, logistics, economics, politics, and methodology of altering the environment of an extraterrestrial world. The renowned astronomer Carl Sagan proposed the planetary engineering of Venus in an article published in the journal Science in 1961. Sagan imagined seeding the atmosphere of Venus with algae, which would convert water, nitrogen and carbon dioxide into organic compounds. As this process removed carbon dioxide from the atmosphere, the greenhouse effect would be reduced until surface temperatures dropped to "comfortable" levels. 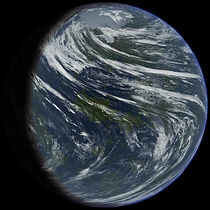 The resulting carbon, Sagan supposed, would be incinerated by the high surface temperatures of Venus, and thus be sequestered in the form of "graphite or some involatile form of carbon" on the planet's surface. However, later discoveries about the conditions on Venus made this particular approach impossible. One problem is that the clouds of Venus are composed of a highly concentrated sulfuric acid solution. Even if atmospheric algae could thrive in the hostile environment of Venus's upper atmosphere, an even more insurmountable problem is that its atmosphere is simply far too thick—the high atmospheric pressure would result in an "atmosphere of nearly pure molecular oxygen" and cause the planet's surface to be thickly covered in fine graphite powder. This volatile combination could not be sustained through time. Any carbon that was fixed in organic form would be liberated as carbon dioxide again through combustion, "short-circuiting" the terraforming process. Sagan also visualized making Mars habitable for human life in "Planetary Engineering on Mars" (1973), an article published in the journal Icarus. Three years later, NASA addressed the issue of planetary engineering officially in a study, but used the term "planetary ecosynthesis" instead. The study concluded that it was possible for Mars to support life and be made into a habitable planet. The first conference session on terraforming, then referred to as "Planetary Modeling", was organized that same year. In March 1979, NASA engineer and author James Oberg organized the First Terraforming Colloquium, a special session at the Lunar and Planetary Science Conference in Houston. Oberg popularized the terraforming concepts discussed at the colloquium to the general public in his book New Earths (1981). Not until 1982 was the word terraforming used in the title of a published journal article. Planetologist Christopher McKay wrote "Terraforming Mars", a paper for the Journal of the British Interplanetary Society. The paper discussed the prospects of a self-regulating Martian biosphere, and McKay's use of the word has since become the preferred term. In 1984, James Lovelock and Michael Allaby published The Greening of Mars. Lovelock's book was one of the first to describe a novel method of warming Mars, where chlorofluorocarbons (CFCs) are added to the atmosphere. Motivated by Lovelock's book, biophysicist Robert Haynes worked behind the scenes to promote terraforming, and contributed the neologism Ecopoiesis, forming the word from the Greek οἶκος, oikos, "house", and ποίησις, poiesis, "production". Ecopoiesis refers to the origin of an ecosystem. In the context of space exploration, Haynes describes ecopoiesis as the "fabrication of a sustainable ecosystem on a currently lifeless, sterile planet". Fogg defines ecopoiesis as a type of planetary engineering and is one of the first stages of terraformation. This primary stage of ecosystem creation is usually restricted to the initial seeding of microbial life. As conditions approach that of Earth, plant life could be brought in, and this will accelerate the production of oxygen, theoretically making the planet eventually able to support animal life. Planetary engineering: the application of technology for the purpose of influencing the global properties of a planet. Geoengineering: planetary engineering applied specifically to Earth. It includes only those macroengineering concepts that deal with the alteration of some global parameter, such as the greenhouse effect, atmospheric composition, insolation or impact flux. Terraforming: a process of planetary engineering, specifically directed at enhancing the capacity of an extraterrestrial planetary environment to support life as we know it. The ultimate achievement in terraforming would be to create an open planetary ecosystem emulating all the functions of the biosphere of Earth, one that would be fully habitable for human beings. Habitable Planet (HP): A world with an environment sufficiently similar to Earth as to allow comfortable and free human habitation. 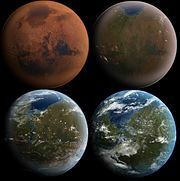 Fogg suggests that Mars was a biologically compatible planet in its youth, but is not now in any of these three categories, because it can only be terraformed with greater difficulty. An absolute requirement for life is an energy source, but the notion of planetary habitability implies that many other geophysical, geochemical, and astrophysical criteria must be met before the surface of an astronomical body is able to support life. Of particular interest is the set of factors that has sustained complex, multicellular animals in addition to simpler organisms on Earth. Research and theory in this regard is a component of planetary science and the emerging discipline of astrobiology. Once conditions become more suitable for life of the introduced species, the importation of microbial life could begin. As conditions approach that of Earth, plant life could also be brought in. This would accelerate the production of oxygen, which theoretically would make the planet eventually able to support animal life. In many respects, Mars is the most Earth-like planet in the Solar System. It is thought that Mars once had a more Earth-like environment early in its history, with a thicker atmosphere and abundant water that was lost over the course of hundreds of millions of years. 2) reacts with rocks to form carbonates, thus drawing atmosphere off and binding it to the planetary surface. On Earth, this process is counteracted when plate tectonics works to cause volcanic eruptions that vent carbon dioxide back to the atmosphere. On Mars, the lack of such tectonic activity worked to prevent the recycling of gases locked up in sediments. Second, the lack of a magnetosphere around Mars may have allowed the solar wind to gradually erode the atmosphere. Convection within the core of Mars, which is made mostly of iron, originally generated a magnetic field. However the dynamo ceased to function long ago, and the magnetic field of Mars has largely disappeared, probably due to "... loss of core heat, solidification of most of the core, and/or changes in the mantle convection regime." Results from the NASA MAVEN mission show that the atmosphere is removed primarily due to Coronal Mass Ejection events, where outbursts of high-velocity protons from the sun impact the atmosphere. Mars does still retain a limited magnetosphere that covers approximately 40% of its surface. Rather than uniformly covering and protecting the atmosphere from solar wind, however, the magnetic field takes the form of a collection of smaller, umbrella-shaped fields, mainly clustered together around the planet's southern hemisphere. Finally, between approximately 4.1 and 3.8 billion years ago, asteroid impacts during the Late Heavy Bombardment caused significant changes to the surface environment of objects in the Solar System. The low gravity of Mars suggests that these impacts could have ejected much of the Martian atmosphere into deep space. Terraforming Mars would entail two major interlaced changes: building the atmosphere and heating it. A thicker atmosphere of greenhouse gases such as carbon dioxide would trap incoming solar radiation. Because the raised temperature would add greenhouse gases to the atmosphere, the two processes would augment each other. Carbon dioxide alone would not suffice to sustain a temperature above the freezing point of water, so a mixture of specialized greenhouse molecules might be manufactured. 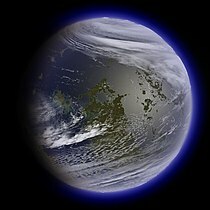 Terraforming Venus requires two major changes; removing most of the planet's dense 9 MPa carbon dioxide atmosphere and reducing the planet's 450 °C (723.15 K) surface temperature. These goals are closely interrelated, because Venus's extreme temperature is thought to be due to the greenhouse effect caused by its dense atmosphere. Sequestering the atmospheric carbon would likely solve the temperature problem as well. Although the gravity on Earth's moon is too low to hold an atmosphere for geological spans of time, if given an atmosphere, it would retain the atmosphere for spans of time that are long compared to human lifespans. Landis and others have thus proposed that it could be feasible to terraform the moon, although not all agree with that proposal. Landis estimates that a 1 PSI atmosphere of pure oxygen on the moon would require on the order of two hundred trillion tons of oxygen, and suggests it could be produced by reducing the oxygen from an amount of lunar rock equivalent to a cube about fifty kilometers on an edge. Alternatively, he suggests that the water content of "fifty to a hundred comets" the size of Halley's comet would do the job, "assuming that the water doesn't splash away when the comets hit the moon." Likewise, Benford calculates that terraforming the moon would require "about 100 comets the size of Halley's." Other possible candidates for terraforming (possibly only partial or paraterraforming) include Titan, Callisto, Ganymede, Europa, and even Mercury, Saturn's moon Enceladus, and the dwarf planet Ceres. Many proposals for planetary engineering involve the use of genetically engineered bacteria. As synthetic biology matures over the coming decades it may become possible to build designer organisms from scratch that directly manufacture desired products efficiently. Lisa Nip, Ph.D. candidate at the MIT Media Lab's Molecular Machines group, said that by synthetic biology, scientists could genetically engineer humans, plants and bacteria to create Earth-like conditions on another planet. Gary King, microbiologist at Louisiana State University studying the most extreme organisms on Earth, notes that "synthetic biology has given us a remarkable toolkit that can be used to manufacture new kinds of organisms specially suited for the systems we want to plan for" and outlines the prospects for terraforming, saying "we'll want to investigate our chosen microbes, find the genes that code for the survival and terraforming properties that we want (like radiation and drought resistance), and then use that knowledge to genetically engineer specifically Martian-designed microbes". He sees the project's biggest bottleneck in the ability to genetically tweak and tailor the right microbes, estimating that this hurdle could take "a decade or more" to be solved. He also notes that it would be best to develop "not a single kind microbe but a suite of several that work together". DARPA is researching using photosynthesizing plants, bacteria, and algae grown directly on the Mars surface that could warm up and thicken its atmosphere. In 2015 the agency and some of its research partners have created a software called DTA GView − a 'Google Maps of genomes', in which genomes of several organisms can be pulled up on the program to immediately show a list of known genes and where they are located in the genome. According to Alicia Jackson, deputy director of DARPA's Biological Technologies Office by this they have developed a "technological toolkit to transform not just hostile places here on Earth, but to go into space not just to visit, but to stay". It has also been suggested that instead of or in addition to terraforming a hostile environment humans might adapt to these places by the use of genetic engineering, biotechnology and cybernetic enhancements. There is a philosophical debate within biology and ecology as to whether terraforming other worlds is an ethical endeavor. From the point of view of a cosmocentric ethic, this involves balancing the need for the preservation of human life against the intrinsic value of existing planetary ecologies. On the pro-terraforming side of the argument, there are those like Robert Zubrin, Martyn J. Fogg, Richard L. S. Taylor and the late Carl Sagan who believe that it is humanity's moral obligation to make other worlds suitable for life, as a continuation of the history of life transforming the environments around it on Earth. They also point out that Earth would eventually be destroyed if nature takes its course, so that humanity faces a very long-term choice between terraforming other worlds or allowing all terrestrial life to become extinct. Terraforming totally barren planets, it is asserted, is not morally wrong as it does not affect any other life. The opposing argument posits that terraforming would be an unethical interference in nature, and that given humanity's past treatment of Earth, other planets may be better off without human interference. Still others strike a middle ground, such as Christopher McKay, who argues that terraforming is ethically sound only once we have completely assured that an alien planet does not harbor life of its own; but that if it does, we should not try to reshape it to our own use, but we should engineer its environment to artificially nurture the alien life and help it thrive and co-evolve, or even co-exist with humans. Even this would be seen as a type of terraforming to the strictest of ecocentrists, who would say that all life has the right, in its home biosphere, to evolve without outside interference. The initial cost of such projects as planetary terraforming would be gargantuan, and the infrastructure of such an enterprise would have to be built from scratch. Such technology is not yet developed, let alone financially feasible at the moment. John Hickman has pointed out that almost none of the current schemes for terraforming incorporate economic strategies, and most of their models and expectations seem highly optimistic. National pride, rivalries between nations, and the politics of public relations have in the past been the primary motivations for shaping space projects. It is reasonable to assume that these factors would also be present in planetary terraforming efforts. Terraforming is a common concept in science fiction, ranging from television, movies and novels to video games. ^ "Science Fiction Citations: terraforming". Retrieved 2006-06-16. ^ Sagan, Carl (1961). "The Planet Venus". Science. 133 (3456): 849–58. Bibcode:1961Sci...133..849S. doi:10.1126/science.133.3456.849. PMID 17789744. ^ a b c Sagan 1997, pp. 276–7. ^ Sagan, Carl (1973). "Planetary Engineering on Mars". Icarus. 20 (4): 513. Bibcode:1973Icar...20..513S. doi:10.1016/0019-1035(73)90026-2. ^ Oberg, James Edward (1981). New Earths: Restructuring Earth and Other Planets. Stackpole Books, Harrisburg, Pennsylvania. ^ McKay, Christopher (1982). "Terraforming Mars". Journal of the British Interplanetary Society. ^ Lovelock, James & Allaby, Michael (1984). The Greening of Mars. ^ Haynes, RH (1990), "Ecce Ecopoiesis: Playing God on Mars", in MacNiven, D. (1990-07-13), Moral Expertise: studies in practical and professional ethics, Routledge. pp. 161–163. ISBN 0-415-03576-7. ^ οἶκος. Liddell, Henry George; Scott, Robert; A Greek–English Lexicon at the Perseus Project. ^ ποίησις in Liddell and Scott. ^ a b c Fogg, Martyn J. (1995). Terraforming: Engineering Planetary Environments. SAE International, Warrendale, PA.
^ 1960-, Fogg, Martyn J., (1995). Terraforming : engineering planetary environments. Society of Automotive Engineers. ISBN 1560916095. OCLC 32348444. ^ "Goal 1: Understand the nature and distribution of habitable environments in the Universe". Astrobiology: Roadmap. NASA. Archived from the original on 2011-01-17. Retrieved 2007-08-11. ^ a b Forget, Costard & Lognonné 2007, pp. 80–2. ^ Dave Jacqué (2003-09-26). "APS X-rays reveal secrets of Mars' core". Argonne National Laboratory. Retrieved 2009-06-10. ^ Forget, Costard & Lognonné 2007, pp. 80. ^ Zubrin, Robert M. & McKay, Christopher P. (1997). Technological Requirements for Terraforming Mars. Journal of the British Interplanetary Society, 50, 83. Accessed 2009-06-09. ^ Gerstell, Francisco, Yung, Boxe, & Aaltonee (2001) PNAS 98, pp. 2154-7. ^ Fogg, Martyn J. (1987). "The Terraforming of Venus," Journal of the British Interplanetary Society, 40, pp. 551-564. (abstract). ^ Landis, Geoffrey (2011). "Terraforming Venus: A Challenging Project for Future Colonization" (PDF). doi:10.2514/6.2011-7215. Paper AIAA-2011-7215, AIAA Space 2011 Conference & Exposition, Long Beach CA, Sept. 26–29, 2011. ^ a b c Landis, Geoffrey (1990) "Air Pollution on the Moon," Analog, June. ^ Hiscox, JA; Thomas, DJ (October 1995). "Genetic modification and selection of microorganisms for growth on Mars" (PDF). Journal of the British Interplanetary Society. 48 (10): 419–26. PMID 11541203. ^ "Mercury". The Society. The Society. 29. Retrieved 10 January 2017. ^ Menezes, A. A.; Cumbers, J.; Hogan, J. A.; Arkin, A. P. (5 November 2014). "Towards synthetic biological approaches to resource utilization on space missions". Journal of the Royal Society Interface. 12 (102): 20140715–20140715. doi:10.1098/rsif.2014.0715. PMC 4277073. ^ "Video: Humans Could Engineer Themselves for Long-Term Space Travel". Live Science. Retrieved 10 January 2017. ^ "You Can Now Play God From The Comfort Of Your Garage". Fusion. Retrieved 10 January 2017. ^ "Here's How We'll Terraform Mars With Microbes". Popular Mechanics. 7 May 2015. Retrieved 10 January 2017. ^ "Will tweaked microbes make Mars Earth-like? - Times of India". The Times of India. Retrieved 10 January 2017. ^ "DARPA: We Are Engineering the Organisms That Will Terraform Mars". Vice Motherboard. Retrieved 10 January 2017. ^ Smith, Chris (25 June 2015). "We Definitely Want to Live on Mars – Here's How We Plan to Tame the Red Planet". BGR. Retrieved 10 January 2017. ^ "DARPA Wants To Use Genetically Engineered Organisms To Make Mars More Earth-Like". Tech Times. 27 June 2015. Retrieved 10 January 2017. ^ Gronstal, A.; Pérez, J.E.A. ; Bittner, T.; Clacey, E.; Grubisic, A.; Rogers, D. (1 January 2005). "Bioforming and terraforming: A balance of methods for feasible space colonization". 2. Retrieved 10 January 2017. ^ Lunan, Duncan. Man and the Planets: The Resources of the Solar System. Ashgrove Press. ISBN 9780906798171. Retrieved 10 January 2017. ^ Spitzmiller, Ted. Astronautics: A Historical Perspective of Mankind's Efforts to Conquer the Cosmos. Apogee Books. ISBN 9781894959667. Retrieved 10 January 2017. ^ "Could We Marsiform Ourselves? - Universe Today". Universe Today. 10 January 2017. Retrieved 10 January 2017. ^ "Be Your Own Spaceship: How We Can Adapt Human Bodies for Alien Worlds". Vice Motherboard. Archived from the original on 13 January 2017. Retrieved 10 January 2017. ^ "The Political Economy of Very Large Space Projects". Retrieved 2006-04-28. ^ "China's Moon Quest Has U.S. Lawmakers Seeking New Space Race". Bloomberg. 2006-04-19. Retrieved 2006-04-28. Averner, M. M. & MacElroy, R. D. (1976). On the Habitability of Mars: An Approach to Planetary Ecosynthesis. NASA SP-414. Carr, Michael H. (2007). "Mars: Surface and interior". In Adams-McFadden, Lucy-Ann; Weissman, Paul Robert; Johnson, Torrence V (eds.). Encyclopedia of the solar system. Academic Press. pp. 315–330. ISBN 0-12-088589-1. Faure, Gunter & Mensing, Teresa M. (2007). Introduction to planetary science: the geological perspective. Springer. ISBN 1-4020-5233-2. Fogg, Martyn J. (1995). Terraforming: Engineering Planetary Environments. SAE International, Warrendale, PA. ISBN 1-56091-609-5. Fogg, Martyn J. (1996). "A Planet Dweller's Dream". In Schmidt, Stanley; Zubrin, Robert (eds.). Islands in the Sky. New York: Wiley. pp. 143–67. Fogg Martyn J. (2000). The Ethical Dimensions of Space Settlement (PDF format). Space Policy, 16, 205–211. Also presented (1999) at the 50th International Astronautical Congress, Amsterdam (IAA-99-IAA.7.1.07). Fogg, Martyn J. (1998). "Terraforming Mars: A Review of Current Research" (PDF). Advances in Space Research. Committee on Space Research. 2 (3): 415–420. Bibcode:1998AdSpR..22..415F. doi:10.1016/S0273-1177(98)00166-5. Forget, François; Costard, François & Lognonné, Philippe (2007). Planet Mars: Story of Another World. Springer. ISBN 0-387-48925-8. Kargel, Jeffrey Stuart (2004). Mars: a warmer, wetter planet. Springer. ISBN 1-85233-568-8. MacNiven, D. (1995). "Environmental Ethics and Planetary Engineering". Journal of the British Interplanetary Society. 48: 441–44. Knoll, Andrew H. (2008). "Cyanobacteria and earth history". In Herrero, Antonia; Flores, Enrique (eds.). The cyanobacteria: molecular biology, genomics, and evolution. Horizon Scientific Press. pp. 1–20. ISBN 1-904455-15-8. McKay Christopher P. & Haynes, Robert H. (1997). Implanting Life on Mars as a Long Term Goal for Mars Exploration, in The Case for Mars IV: Considerations for Sending Humans, ed. Thomas R. Meyer (San Diego, California: American Astronautical Society/Univelt), Pp. 209–15. Read, Peter L.; Lewis, Stephen R. (2004). The Martian climate revisited: atmosphere and environment of a desert planet. Springer. ISBN 3-540-40743-X. Sagan, Carl & Druyan, Ann (1997). Pale Blue Dot: A Vision of the Human Future in Space. Ballantine Books. ISBN 0-345-37659-5. Solar wind ripping chunks off Mars. (November 25, 2008) Cosmos Accessed 6/18/2009. Thompson, J. M. T. (2001). Visions of the future: astronomy and Earth science. Cambridge University Press. ISBN 0-521-80537-6. Wikimedia Commons has media related to Terraforming.